Look over the Subscription Types and then Choose one that fits. 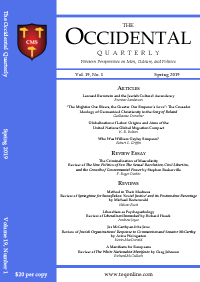 Each subscription is for 1 year (4 issues) of The Occidental Quarterly. If you have a preference for which season you wish it to begin – leave us a ticket as you sign up and purchase. PDFs are available upon payment each season by the 21st March/June/September/December. 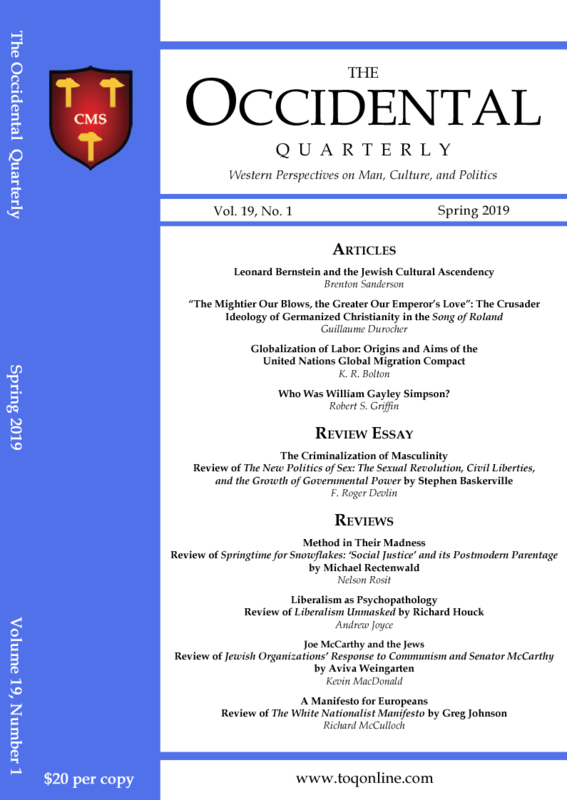 Donate to The Occidental Quarterly, as we truly need you now. Use the system to get registered and then click your account to receive your complimentary PDF downloads (free) and get your paid content after we receive payment. Groups of 4 Print Issues back to Spring 2014 – $55/4-pk + s&h. In these last years the production of a high quality print magazine is very expensive to accomplish, let alone on a shoe-string budget. As you all are aware, mailing costs continue to rise (even a letter stamp goes to 55 cents 1/27/19). In order to keep the cost within reach of as many readers as possible, the prices above do not usually cover the actual costs incurred. Even this website is a significant monthly expense. ? Could you donate (tax-deductible) some amount to help defray expenses? Any amount is a great help and we thank those who already give sacrificially now. Digital versions are made available to those who donate regularly. Thank you for your Donation! Note: We are looking for a new distributor to retrieve and mail journals older than 2014.